New Delhi: The toll in Bihar floods rose to 159 with three more deaths being reported today, while the situation in Uttar Pradesh improved due to receding river waters even as some parts of northern India received rains. 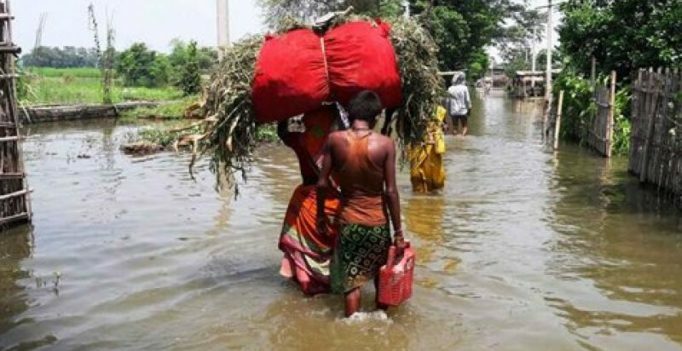 The floods in Bihar caused by overflowing of Ganga, Sone, Punpun, Burhi Gandak, Ghaghra, Kosi and other rivers have affected 37.74 lakh people in 2,029 villages of 12 districts, the Disaster Management Department said. A total of 7.06 lakh people have been evacuated so far from the affected districts of Buxar, Bhojpur, Patna, Vaishali, Saran, Begusarai, Samastipur, Lakhisarai, Khagaria, Munger, Bhagalpur and Katihar, it said. The Ganga is flowing above the danger mark at Digha Ghat, Gandhi Ghat, Hathidah (in Patna), Bhagalpur and Kahalgaon (in Bhagalpur district), and in Munger and Buxar districts. Though weather remained mainly dry in most parts of Bihar, light rains occurred at one or two places in north-eastern parts and heavy rainfall recorded in Kishanganj. In Uttar Pradesh, the weather was dry over eastern parts while light rains occurred at isolated places over the western parts. With lesser rainfall in the past few days water in major rivers have started receding though some of those continue to flow above danger mark. According to a Central Water Commission report, water in the Ganga is receding, but the river is still flowing above danger level at Varanasi, Ghazipur and Ballia. Around 8.7 lakh people in 987 villages of Varanasi, Allahabad, Ghazipur and Ballia are affected due to floods and relief and rescue operations are on. Water in Yamuna is also receding, while the Sharda river is flowing above danger mark at Palliakalan (Kheri), it said, adding the Rapti and the Ghagra river waters have also started receding. Heavy rains lashed parts of the national capital leading to waterlogging and traffic jams in a few areas, even as the mercury settled at normal level. “The maximum and minimum temperatures were recorded at 34.7 and 26.5 degrees Celsius respectively, both normal for this time of the year,” a MeT official said. The Safdarjung observatory recorded 15.2 mm rainfall while the reading at Palam observatory was 8 mm. Rains occurred at various places in Punjab and Haryana, bringing down mercury several notches below normal in both states. Moderate rainfall occurred in parts of Himachal Pradesh leading to marginal drop in maximum temperatures. Sundernagar received 48 mm rains. Some parts of Rajasthan received rains, with Sikar and Churu recording 46.4 mm and 29.9 mm rainfall. In Jodhpur the maximum temperature was 34 degrees Celsius, while Jaipur recorded a high of 33 degrees Celsius. In West Bengal, scant rainfall and high humidity caused discomfort to people in the southern parts of the state, while heavy rains occurred in the sub-Himalayan districts.